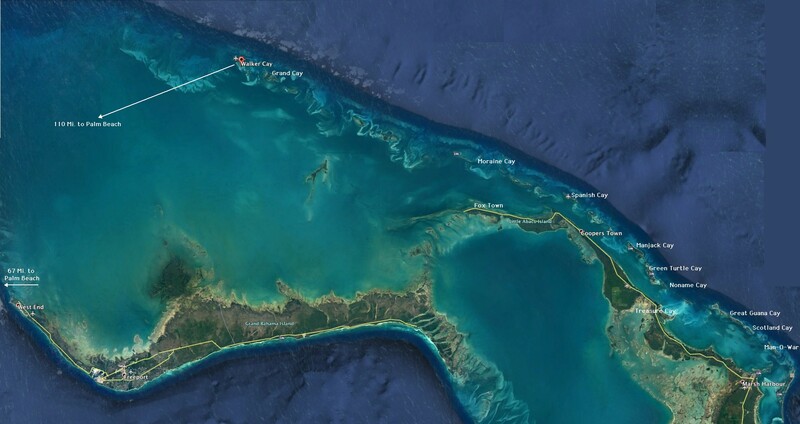 The Top of the Bahamas, Walkers Cay, Grand Cay, Abaco and Spanish Cay. A brief summation and history. The Abaco Cays mentioned on this page are off the beaten path and difficult to get to unless by ones boat or private plane. They are too far and not permited by rental boat rental companies. 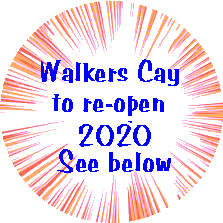 In a nutshell, Walkers Cay is (presently) uninhabited. 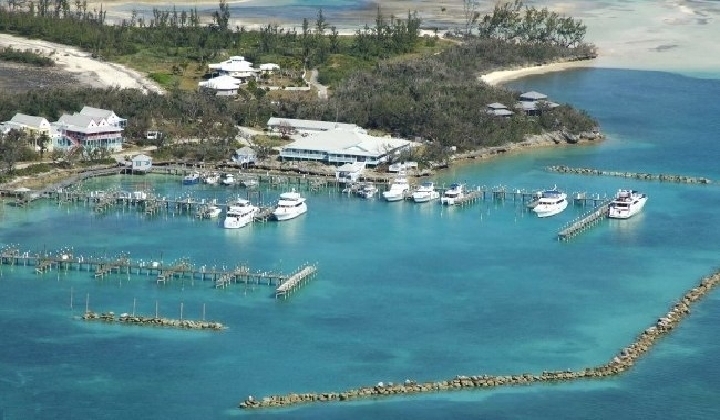 It's neighbor, Grand Cay has a populated settlement, accommodations marina and restaurant. Access is by plane at he Walkers Cay air strip and ferry over. Spanish Cay furthure south has a resort and a couple houses and accessed by their air strip or ferry from the mainland at Coopers Town. Lastly there is Moraine Cay which is private but available with homestead for rent. Walkers Cay was the first island stop of my first trip to the Abacos by boat back in '93, fittingly 20 years after my first visit to Green Turtle Cay in '73. The 80's & early 90's were the days when Walkers was in it's heyday. Jet-setters would fly in on their Lear Jets (on a short runway) for a days fishing on their yachts. Some didn't make it as a burnt fuselage or two lined runway here and there. The resort stood high on the cay with a magnificent views west and south. With the exception of the Customs office, it is basically the only thing on the island. Customs were needed for the fly-in folks along with those boaters bypassing West End. Walkers provided guest rooms, restaurant and bar and a large pool. In addition to the marina there was a dive shop of some repute. The resort was originally developed by Robert H. Abplanalp the inventor of the "clog-free" spray valve used in today's aerosol spray cans. He was also a friend & confidant of President Nixon. The Shootout's organizers eventually moved to Boat Harbour Marina in Marsh Harbour in '96. Without the prestige and luster the Shootout brought to the island, Walkers slipped into disrepair. Then the double whammy by Hurricanes Frances and Jeanne in '04, put the finishing touches on the resorts already worsening state, and the resort closed. The Customs office remains open till this day as it is needed to service the needs of the fishing settlement of the adjacent Island of Grand Cay. Rumors persist of Walkers reopening and or new investors showing interest in the resort property. 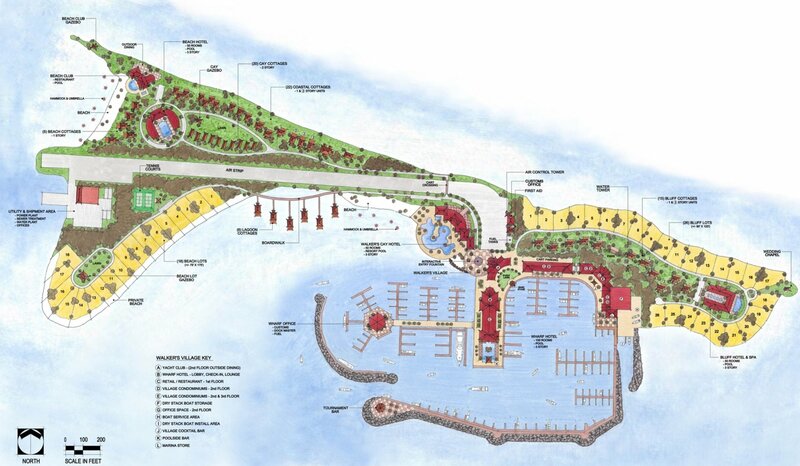 It wasn't until late summer of 2010 that these rumors bore some credibility when the Bahamas Investment Authority approved plans for development of the 69 acre island. 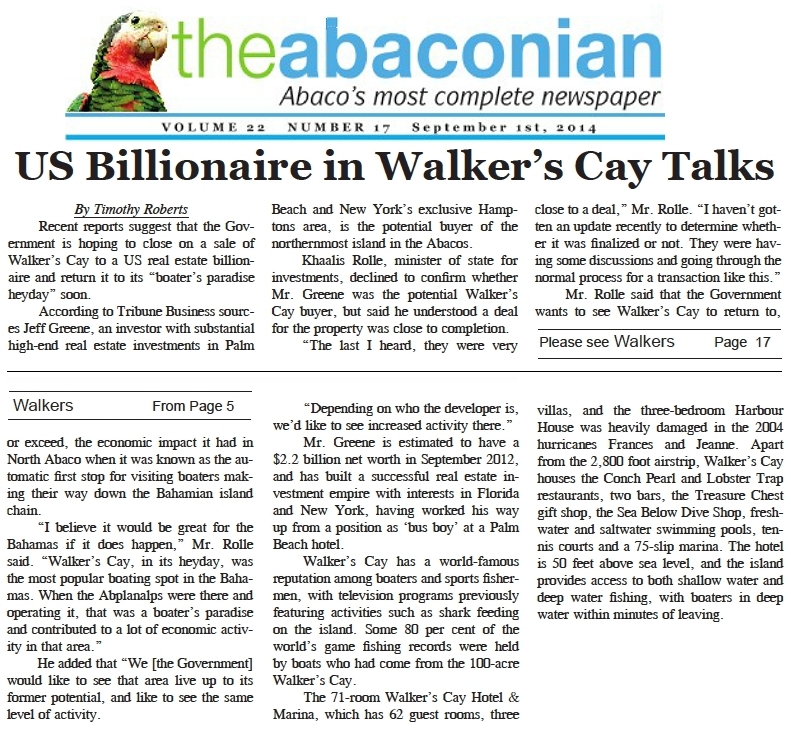 Buy 2011 all was quiet again still with some murmuring in fall of 2012 on the Abaco Forum (bulletin board). Then again in the Sept 2014 issue of the Abaconian, there was this story, which also fizzled. 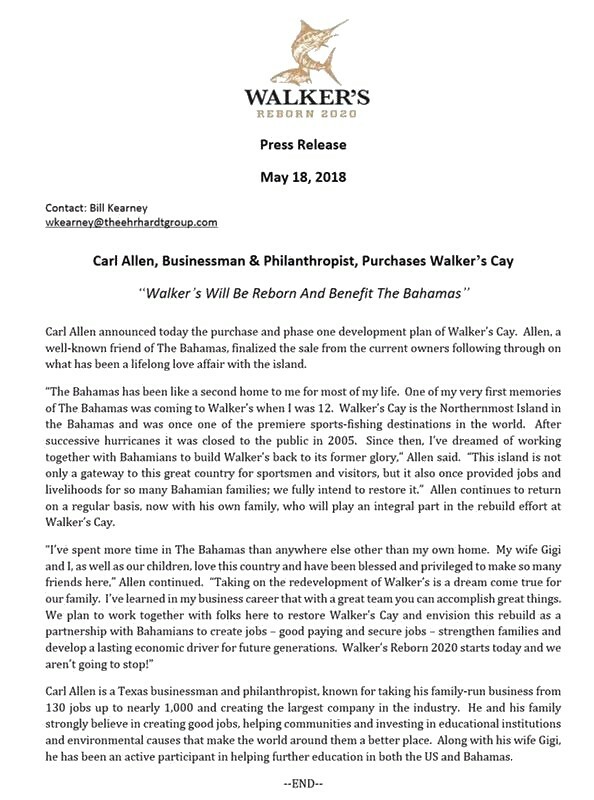 In May 2018, it finally seemed Walkers will spring to life once again with the announcement by Carl Allen, a Texas businessman and philanthropist. In his own words. - The Press Release - The New Lay of the Island. I chronicled three of my six trips by boat aboard three different boats all named Motu Iti. We stopped at Walkers with two of them. Grand Cay photo by Gary Moline. Read his story below. Grand Cay as mentioned is just south of Walkers. Most of the staff at the old Walkers Resort lived here and since its closing left the island or returned to commercial fishing - lobstering & conch too. In recent times Grand Cay has attracted more and more Florida small boat sport fisherman as it's just a 5 hours / 110 mile trip from West Palm. That's 50 miles closer than Green Turtle Cay, 80 closer than Marsh Harbour. Also since the customs office on Walkers remains in service it makes for a hassle free trip, weather permitting. It's sole proprietor of any business back in the day was Rosie who ran his restaurant. I visited there back on a couple trips back in the mid 90's and dined on Rosie's famous combo of cracked conch, grouper, lobster and turtle steak. Some may disapprove of the latter, but yum. Picking up the slack of the resort's closing the little island settlement and Rosie's Place and Marina has grown considerably not the least of which is the addition in recent times of new hotel cottages, restaurant, bar and fuel dock.  (I am surprised he has a website). And there is now a second restaurant on the island but little else. Still a charming island settlement few will see. The following fishing trip report to Grand Cay. It's a fun read with lots of great pictures and can bring one up to date on the Island. Gary's report is here. Moraine Cay is a private 30 acre island paradise of some elevation often visited by passing yachtsmen. There are extensive reefs to the immediate East and North of Moraine Cay, which can be accessed from within just a few feet of shore. They litter the ocean floor all the way out to an extensive barrier reef located roughly a mile and a half offshore. 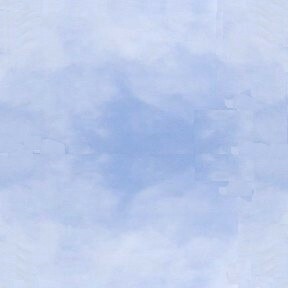 (Video). The owners have a cottage on the island available for rent. Most folks renting here usually arrive by boat from the states after clearing customs in West End or Spanish Cay. If you go the rental boat route from Abaco, you can provision at M&M's Groceries in Fox Town, (9 mi) or better yet, bring your supplies with you. A Moraine Cay Adventure is strictly for the eco tourist as the cottage is a 12 volt / Propane home, no A/C, you wont need it. Oh, as you might expect, it is for sale. Spanish Cay is the third of the outlying barrier cays heading south that has any populace and those folks are attached with the resort there. 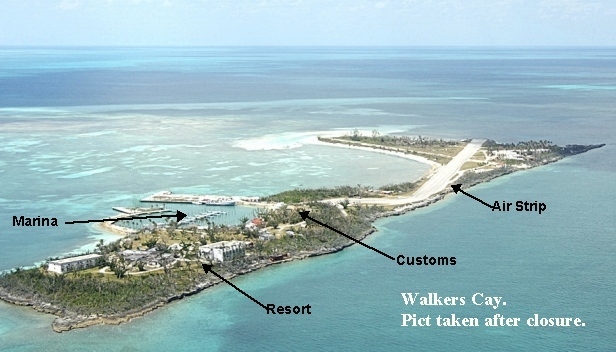 Like Walkers, Spanish Cay is a port of entry with operating airstrip and customs. There is a fine large marina attached to the Resort at Spanish Cay once owned by, Clint Murchison who owned the Dallas Cowboys. The resort has changed hands a couple times since then and has gone thru a couple of hurricanes and undergone a major overhaul including brand new docks. As part of the renovation they've added tennis courts a new air conditioned restaurant and game room/bar overlooking a fresh water swimming pool and the sea of Abaco. They claim three lovely beaches and golf carts are available to explore the island. Their Wreckers Bar, not always open, is the only eatery in the Abacos suspended over the Ocean. If peace and quiet is what you are looking for, this is the place with snorkeling, fishing and shelling at your beckoned call. Throw in a good book and a Pina Colada from their bar and your in business. Across from Spanish Cay on Abaco's mainland and 42 Miles from Marsh Harbour, 22 from Treasure Cay, lies the settlement of COOPERS TOWN. It's about a $50 taxi ride from Treasure Cay. The government dock is where you'd pick up a ferry to Spanish Cay. Unfortunately there are only two scheduled, early morning and late afternoon and primarily intended for the resorts day workers. A charter is about $200. So it looks like a late arrival and early departure is the only way to go. Call them on this in any case. Note: the Resort at Spanish Cay is only opened in season. Information on North Abaco Settlements, Coopers Town, Fox Town, Crown Haven can be found "Great Abaco North & Little Abaco"